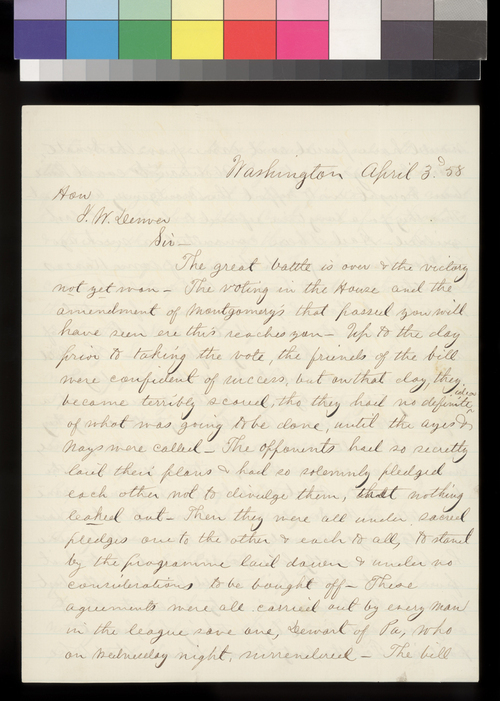 Robert S. Stevens, writing from Washington, D.C., to Governor James W. Denver, reports on the U.S. House of Representative's passage of the Crittenden-Montgomery resolution, which proposed to resubmit the Lecompton Constitution to a vote in Kansas Territory. While Stevens, and by implication Denver, support the Crittenden-Montgomery resolution, Stevens contends that it was in the Democratic Party's best interests for Kansas to be admitted under the Lecompton Constitution. Stevens also comments on his efforts to get New York Indian lands in Kansas opened to preemption.